Sadly, I do not have Telegram, but if I did, I would surely pray to His Noodlyness with it. The same be for me. But for ye who have Telegram, ye should join. Seth, if you have a class called Religious Studies, and any set project involves research, you should be permitted to use the Internet. However, that is unlikely to include Social Media, unless you had a specific reason. 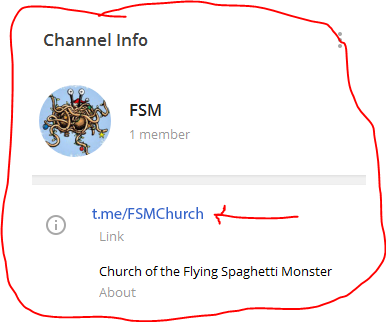 Anyway, it seems like you are already a Pastafarian and don’t need ‘to join’. I`m Charlie Bean. I needed a loan to buy a house and I searched for a mortgage loan from all banks and I was denied and I loss hope of having my own house until I came across a post just as you reading my post now. I saw a post about a Financial Service Company who gives loan at 2% interest so I applied in STEAKLEY FINANCIAL SERVICES using their email [email protected]. And my loan was granted it was like a dream but was true and now am a owner of a house in Toronto and am paying the mortgage loan with no stress and I also requested if I can be granted a business loan and I was also granted. Now am living a happy life, I will advice you if you have an financial problems and you need money to settle it so you can pay with no stress just contact Steakley Financial Service at their email [email protected] or number +1(512) 714-8010. Ah, what a great idea to get more conversations going with the Telegram app. I love it when we can interact with a great community. I will download the app on my lg phone and join the conversation. Hope we can keep the conversations going on Evangelism. Ah, a spammer that pays attention to context and almost gets it right, well done sir. Only, you ever looked at your pseudo in a mirror? Gives you a serious handicap for debating on religion.